At the end of the following narrative, each frame is illustrated in detail in a sequential collage. The length of time for the sequence from Frame #1 to Frame #19 is 1.3 seconds. The time between each frame is .069 seconds. Jessica Schipper's time for the event was 2:06.39. There is little change in this stroke than that exhibited in the previous world championships in Montreal. The arm action on entry does not contain as much deliberate outward opening with the hands as demonstrated by several other top swimmers. Her post-entry action is not as immediately deliberate as Otylia Jedrzejczak's action. The slight delay on developing propulsion might be to accommodate the completion of the kick. There appears to be a minor repositioning of the hips because of the kick. The pull is not initiated until Frame #6 when the elbows begin to bend. An immediate reposition of the right hand occurs as the elbows flex (Frame #7). One could hypothesize that this initiates an "insweep" but two frames later (Frame #9), direct pulling is initiated. Frames #9 through #14 illustrate a very powerful double-arm action. The total upper-arm-to-finger-tip propelling surface is employed. Frames #11 and #12 show the drag force turbulence pocket extending from the fingers to the shoulders. The alignment of the total arms is not vertical because a force component has to be generated to support the head and shoulders being raised to breathe. In a non-breathing stroke, it would be expected that the arm alignment would be almost vertical because there would be no need to raise the head or shoulders. Raising the head and shoulders to breathe causes the hips to drop slightly (Frames #8 through #10). As the head and shoulders are returned to the water, the knees drop to be aligned with the lowered hips as a preparatory movement for kicking. The second kick is initiated as the propulsive phase of the arms is completed. This is a good feature because it ensures that maximum power is maintained through the latter part of the arm stroke and facilitates a smooth transition into the recovery. The second kick continues until the main force component (vertical) of the recovery is completed (Frames #13 through #15). As soon as the arms begin to recover forward and outward, the head is lowered further, and the legs rise (beginning in Frame #16). As is to be expected, Jessica Schipper's leg kicks are timed with the maximum vertical force components of the arm movements. In this sequence, some extra influence is likely to come from the head rising and lowering in the breathing action. It does not appear that the swimmer is altering the kick in any vain attempt to "gain added propulsion", which is a good feature. 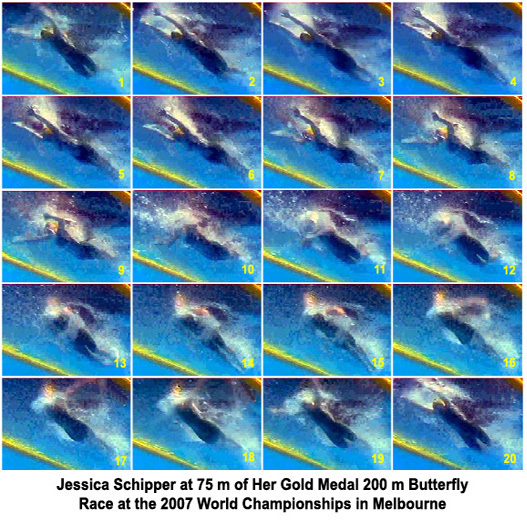 Generally, there are good features in Jessica Schipper's action. It would be worthwhile to speculate what would happen to her stroke if she attempted to achieve a greater degree of "elbows-up" early in the pulling phase. That would have the potential to extend the length of force-application as well as increasing its magnitude, particularly in the latter half of the force production.